The best 3 hunts in life are the first, the last and the next. Many hunters may even say that their favorite duck is the next one over the decoys, but the universal aura of wildfowling is seducing free-to-go-anywhere-in-the-fenceless-sky-they-damned-well-choose birds to within about 100 feet. It’s how the game is played. Great hunts don’t happen by accident either. Understanding waterfowl’s life habits is paramount; skillfully using tools of the trade is essential. As our understanding grows so too does the world around us. Waterfowl are migratory and we eventually find ourselves compelled to new areas, to species unobtainable in our own back yards. There are about 50 doable waterfowl species in North America alone. And suddenly it becomes a real big world. The rules of the game remain the same, but the playing fields change while hunting myriad waterfowl species worldwide. From 16,000 feet in the mountains to below sea level in levee-protected settings, and from the river red gum swamps of the South Pacific to ravaging seas near the Arctic Circle, there exists a spectacular variety of waterfowl. Many people go their entire lives never knowing that it’s not just about dead ducks. We hunters know better. Destination hunting is not only about a trophy; it’s an immersive experience of playing the game. It’s the simple reminder of what we’ve experienced that those feathered trophies shimmering in our game rooms most represent. 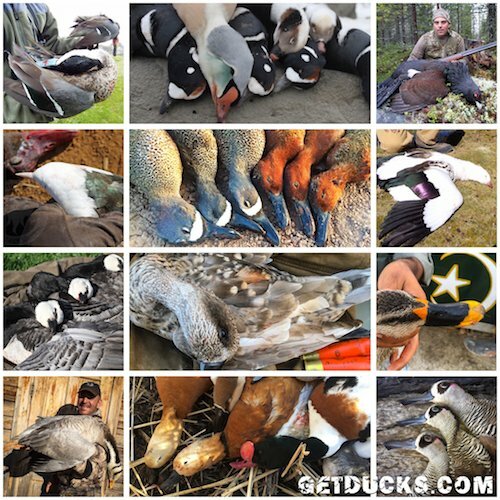 Great duck hunting conversations among client-friends at campfires and dinner tables around the world, usually revolve around hunting the bread-and-butter mallards, pintails, honkers and woodies that we all cut our teeth on. Following is a sampling of not-so-common gamebirds from around the world that sparked many long-lasting friendships.